Grilled eggplant served "lasagna style"
Trim and slice eggplant lengthwise. Brush eggplant slices with extra virgin olive oil and grill until tender. Add fresh herbs to your prepared tomato sauce and heat through. 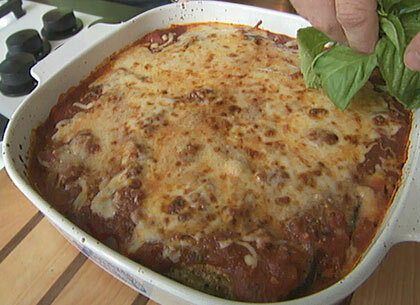 Layer grilled eggplant ("lasagna style") in a baking dish with sauce and mozzarella. Top with grated parmesan cheese. Bake at 450 degrees for 15 minutes and enjoy! This segment appears in show #3108.